Normally a crossover event like this would have been a cause for celebration, but this brace of covers elicited anything but that. Why is that you ask? First, although this was a beautiful Infantino/Anderson cover, it continued Infantino’s unfortunate trend of bulking-up the Flash. 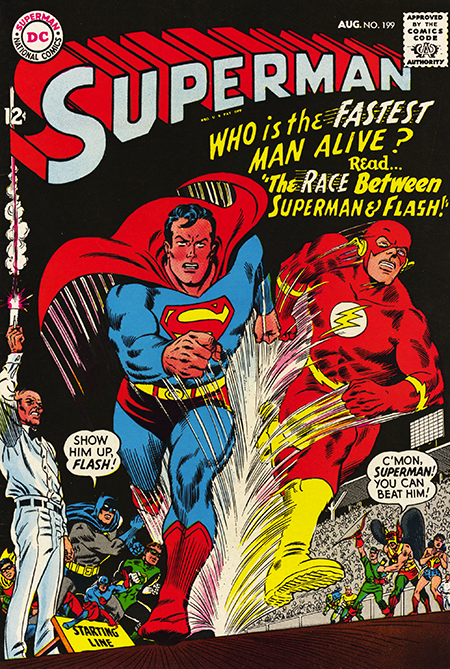 He had slowly begun doing this on recent issues of The Flash, most noticeably on the covers. 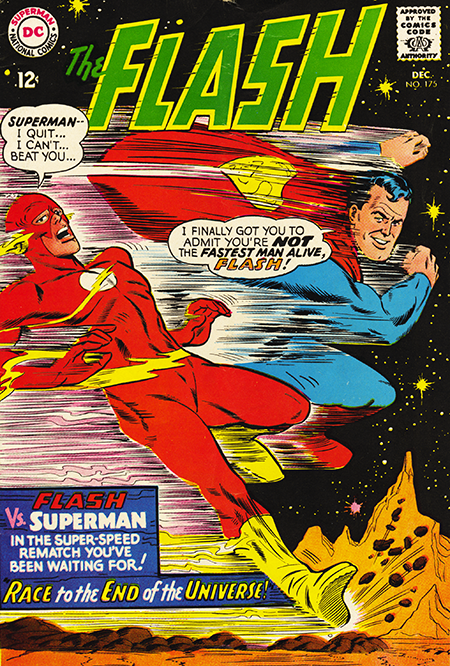 Here the Flash is weight enhanced to nearly Superman proportions. My personal suspicion was that he was doing it in response to Jack Kirby’s work over at Marvel and perhaps they felt that this was why the upstart Marvel was starting to sell so many books. Whatever the reason, I missed the Flash’s lithe runners physique. As a skinny runner back then, I related to that. TO THE READERS OF THE FLASH: I write to you all now with mixed emotions-! Happy in the fact that I am now going to be involved with ALL the fine titles from DC (my “touch” will be there even if you may not realize it) – and sad that I cannot be drawing my friend of many years – The Flash! In selecting my successor for the Scarlet Speedster, the names Ross Andrew and Mike Eposito kept overwhelming all other possibilities. And after seeing their first fine effort for this issue (a particularly tough story in view of the fact that Superman was guest starred), there is no doubt in my mind that you fans will agree that theses two wonderful artists will make Infantino nothing more than a memory! With your kind encouragement and their wonderful talents, I honestly believe these two gentlemen will carry The Flash on to bigger and better adventures! We’ll talk more about this on the next Flash Fridays, but, right now, I’m feeling a little retroactively faint.